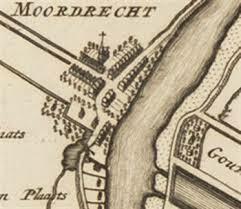 Reijnier Verhoef was baptized in Polsbroek in August 1680 and buried in Gouda in June 1741. He married his 1st wife, Willemijntje Saarse Bouwman, in October 1708 in Moordrecht. Willemijntje was born in Lopik, had 4 children and died in Gouderak in august 1719. Reijnier remarried his 2nd wife Murrigje Willems Kroon in November 1720. The author of the article was T.F. Verhoef. I assumed that - since the author had the same surname as the people in the article, and he had published in such a well-known magazine - he must be an expert, so I assumed that everything he wrote was right. That's why my ancestor Willemijntje Bouwman remained a brick wall for years. Recently, I read DutchGen's tip "A couple usually married in the bride’s home town". I hadn't noticed that in my own research, but I remembered it when, later on, I noticed my Bouwman brick wall again. Since Reijnier Verhoef and Willemijntje Bouman married in Moordrecht, could Willemijntje have originated from Moordrecht instead of Lopik? Research in Moordrecht's records knocked down this brick wall. Willemijntje was baptized in Moordrecht on May 1, 1688. Her parents were Saers Franke and Afie Willems. Willemijntje had 11 siblings. Her grandparents were Vranck Saersen and Appolonia (Pleuntie). Her great-grandfather may have been Saers Pietersz Cos, who was buried on 14-9-1653 in Waddinxveen and married to Barbara Cornelis. Saers Pietersz Cos was a son of Pieter Jansz Cos and Aechgen Saers. 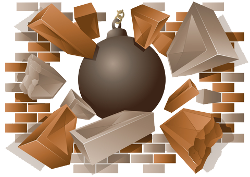 Wonderful to read that my tip helped you knock down a brick wall! Ah, how wonderful to 'meet' another Joan! They're rare in The Netherlands.